Home » Blogs » Does CBO "Expect the TCJA to Significantly Boost" the Economy in 2018? UPDATE: The FRBSF paper has been corrected to remove the erroneous claim that CBO’s growth estimates are well in excess of theirs. 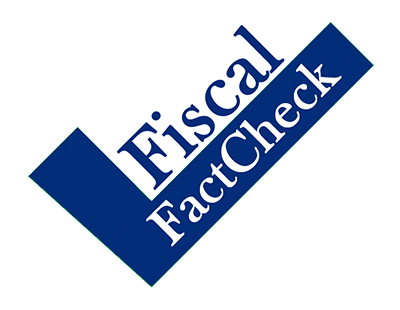 The below fact check is based on an earlier version of the paper, which was reported in several news outlets. A new report published by the Federal Reserve Bank of San Francisco (FRBSF) concluded that the 2017 tax law, the Tax Cuts and Jobs Act (TCJA), will boost the size of the economy in 2018 by between 0 and 1 percent. The report says that "many macroeconomic forecasters expect the TCJA to significantly boost U.S. GDP growth over the next couple of years," singling out estimates from the Congressional Budget Office (CBO) as saying the bill will boost 2018 GDP by 1.3 percentage points. This assertion is based on a misinterpretation of CBO's estimates. 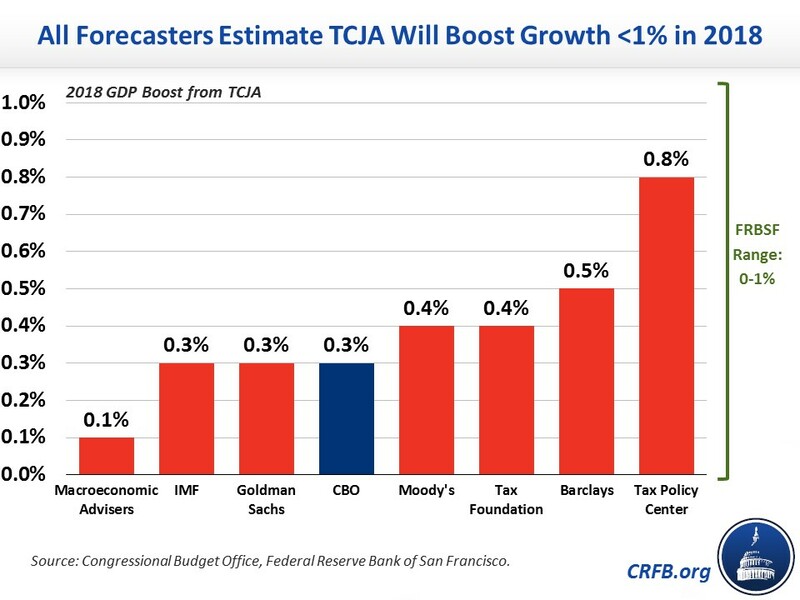 In fact, CBO projects the TCJA will boost GDP by 0.3 percent in 2018 and every estimator agrees with FRBSF that the tax law will increase GDP growth by between 0 and 1 percent this year. We rate this claim as largely false. The FRBSF authors do an excellent job demonstrating how prevailing economic literature informs our understanding of procyclical fiscal policy in times of high employment and strong GDP growth. Deficit-financed fiscal policy, like the tax law, tends to produce the most positive near-term economic effects when the economy is in recession. When the economy is strong, FRBSF explains, policies that produce large short-term deficits tend to be less effective at stimulating growth than during contractionary periods. As a result, FRBSF believe the TCJA will have little, if any, effect on 2018 GDP. ...recall that the CBO, similar to other macroeconomic forecasters, expects the TCJA to boost 2018 GDP growth by around 1.3 percentage points, from 2.0% to 3.3%. The findings by Gross et al. suggest the true boost is more likely to be less than 1 percentage point, while the literature on fiscal spending multipliers suggests an even smaller boost, as low as zero according to some studies. Recent U.S. federal fiscal policy has taken a decidedly procyclical turn, driven primarily by the large and front-loaded tax cuts enacted by the 2017 Tax Cuts and Jobs Act. Many analysts have forecast large increases in GDP growth over the next two to three years as a result. However, recent research finds that the effects of fiscal stimulus on overall economic activity are much smaller during expansions than during downturns. This suggests these forecasts may be overly optimistic. In actuality, CBO projects the tax law will boost 2018 GDP by 0.3 percent (well within the 0 to 1 percent range), and other macroecomic forecasters all project the a boost of between 0.1 and 0.8 percent. The 1.3 percentage point figure cited by the FRBSF authors is based on the difference in CBO's estimates of fourth-quarter-over-fourth-quarter estimates between CBO's June 2017 and April 2018 economic projections. However, only a fraction of that difference is due to the tax law. As we've shown before, CBO only attributes 0.3 percentage points of GDP improvement to the tax law. Another 0.3 percentage points of growth come from the temporary stimulative impact of the 2018 spending deal, and we estimate a further 0.2 percentage points is due to other legislation. The remaining difference is due to changes in economic assumptions and data unrelated to legislation in addition to the timing difference between looking at average growth versus quarter-over-quarter growth. The authors of the paper are correct to warn that deficit-financed stimulus during an economic boom will have muted effects on growth, and they are right to warn that larger deficits could have negative long-term implications. As FRBSF said in its report, "the projected procyclical policy over the next few years may raise concerns regarding the nation's fiscal capacity to respond to future downturns and its ability to manage the growing federal debt." At a time when the debt could exceed its all-time record in just over a decade, lawmakers should be focusing on policies that both grow the economy and put the nation's debt trajectory on a downward path. But the FRBSF authors are wrong to suggest CBO and others significantly overestimate the growth effects of the TCJA. The reality is that CBO's estimate, and the other macroeconomic forecasters' estimates, are in line with – not well in excess of – the conclusions of the FRBSF authors.